Take 2…well actually this was the original card I made for yesterday’s challenge but ended up not really liking it so made the one I posted yesterday. Even though I didn’t totally love it…it was still a good card so I decided to post it today. It’s always good to see someone’s reject! Whisper White – 4 1/2 x 3 1/4, stamp larger splatter using Crushed Curry and smaller splatter using Watermelon Wonder. Stamp happy birthday using Memento Black. Layer onto Basic Black 4 5/8 x 3 3/8. Punch piece of Cherry on the Top dsp using the Washi Tape punch, fold on a diagonal, layer behind the Basic Black layer and add to card front using dimensionals. 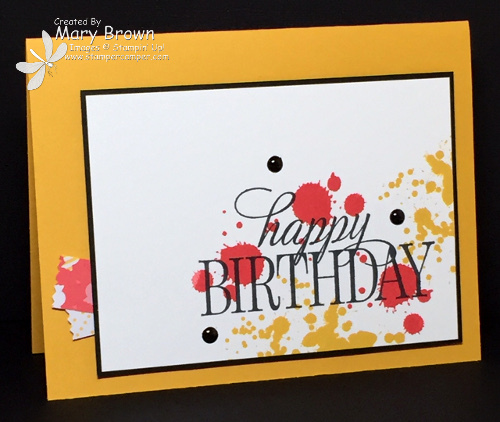 Color 3 Perfect White Accents using black Sharpie and add to card front. 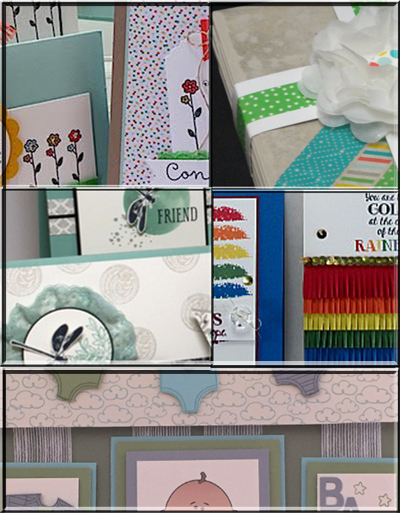 A mini session includes the tutorials for FIVE projects with full step-by-step tutorials for THREE (3) card sets and TWO (2) 3D items. Wow…so what is this going to cost? Only $8.95! We are going LIVE July 26th and you will get ALL 5 ideas right away…no waiting! So head over to Create with Connie and Mary to sign up now! This entry was posted in Clean and Simple (CAS), Create with Connie and Mary and tagged Gorgeous Grunge, Happy Birthday Everyone. Bookmark the permalink.